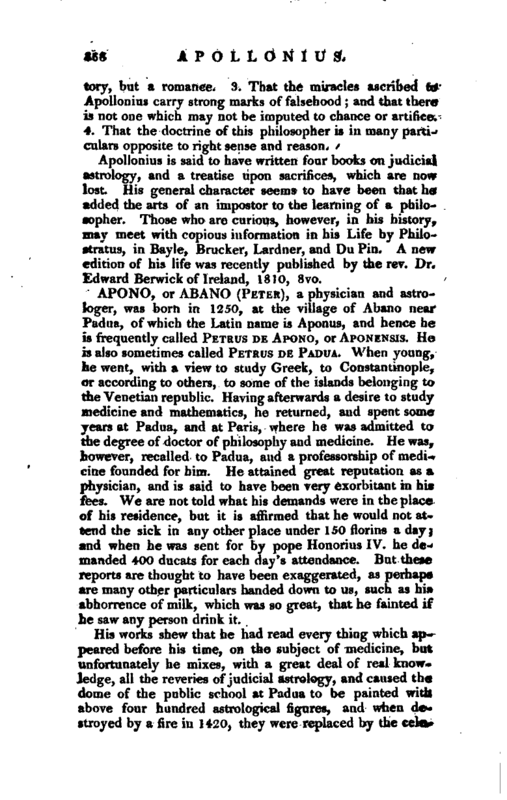 , a physician and astrologer, was born in 1250, at the village of Abano near Padua, of which the Latin name is Aponus, and hence he is frequently called Petrus de Apono, or Aponensis. He is also sometimes called Petrus de Padua. 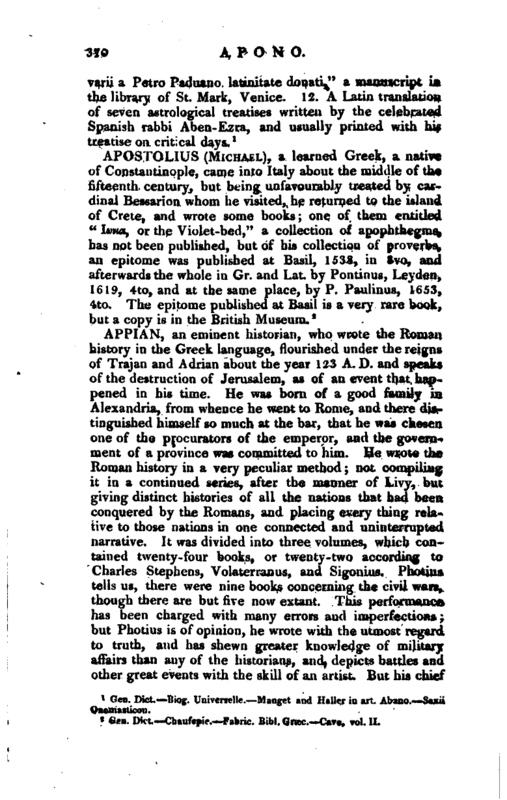 When young, he went, with a view to study Greek, to Constantinople, or according to others, to some of the islands belonging to the Venetian republic. 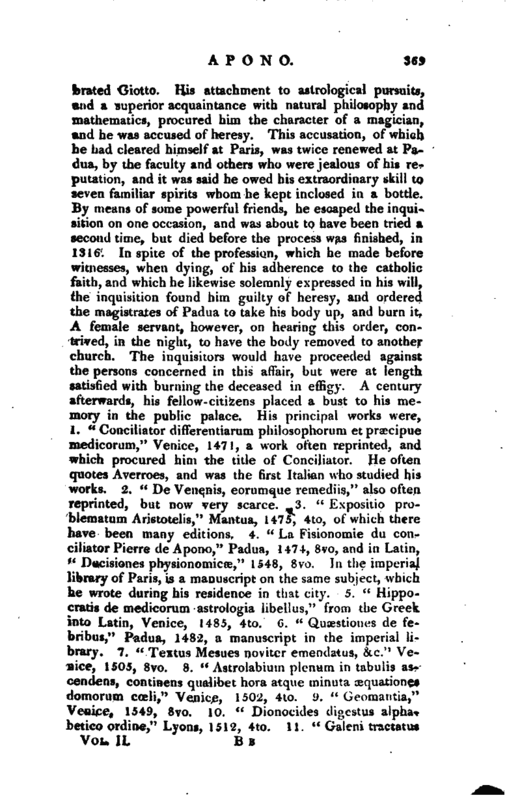 Having afterwards a desire to study medicine and mathematics, he returned, and spent some years at Padua, and at Paris, where he was admitted to the degree of doctor of philosophy and medicine. He was, however, recalled to Padua, and a professorship of medicine founded for him. He attained great reputation as a physician, and is said to have been very exorbitant in his fees. We are not told what his demands were in the place of his residence, but it is affirmed that he would not attend the sick in any other place under 150 florins a day; and when he was sent for by pope Honorius IV. he demanded 400 ducats for each day’s attendance. But these reports are thought to have been exaggerated, as perhaps are many other particulars handed down to us, such as his abhorrence of milk, which was so great, that he fainted if he saw any person drink it. Gen. Dict. Biog. Universelle. Mnnget and —Haller in art. Abano. Saxii Oxomasticon.